Jefferson Airplane were one of the best-known bands of San Francisco’s legendary 60s psychedelic rock scene. They were pioneers of the genre and the first band from the area to achieve mainstream commercial success. 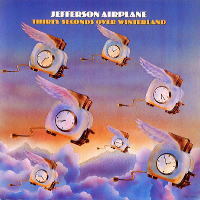 Jefferson Airplane's days were almost up by 1972, and everyone in the band no doubt knew it. In support of their final studio album Long John Silver, they went on one last tour (their first concerts in over a year). By then the band lineup consisted of Grace Slick, Paul Kantner, Jorma Kaukonen, Papa John Creach, Jack Casady and Johnny Barbata. For this last tour they also enlisted their friend David Freiburg (of Quicksilver Messenger Service) to serve as an extra voice, mostly singing Marty Balin's old parts. Recordings of these concerts were put together into a live album, and Thirty Seconds Over Winterland was released in 1973. By the time it was released, Kaukonen and Casady had left to focus on their other group, Hot Tuna. Kantner, Slick and Freiburg released an album as a trio that same year (Baron Von Tolbooth & The Chrome Nun), and Slick's solo debut came out in 1974. Before long the three of them (along with Papa John Creach, Johnny Barbata and new members) would form a new band which they named Jefferson Starship. The Jefferson saga thus went on, but the original band, one of the most important pyschedelic rock groups of the 60s, was finished. you make running a blog look easy. The whole glance of your web site is great, let alone the content material! What's up everyone, it's my first pay a visit at this site, and paragraph is really fruitful for me, keep up posting such content. One Great Album with numerous spam comments above, a great site with a lot of trolls! I am very fond of Jefferson Airplane and most specially Jefferson Airplane eponymous album released in 1989, the reunion album. I have it in vynil but I don't have a running turntable anymore, so I'ld rather have in MP3 and listen to it in my PC. Can you try to find and upload it ? I'ld be very thankful to you although I may already be so, for I have already backuped several of your posts, they are all so good. You have actually a very good taste for music. By my side, I've already picked up Rare Earth, John Mayall, The Allman Brothers Band, Donovan, Canned Heat. Thank you so very much. Great blog...i've grabbed 15 albums and so i will say THANK YOU VERY MUCH AMIGO !! !